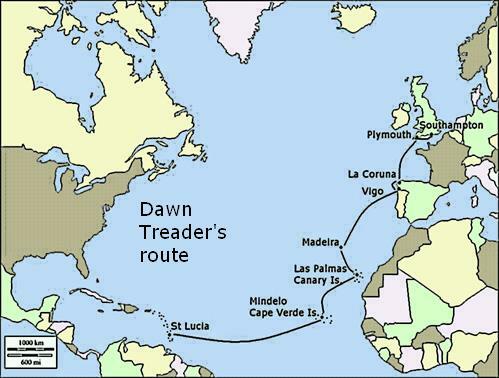 In 1992 David Rudling sailed his fin-keeled Trident Dawn Treader to St Lucia via Spain, the Canaries and the Cape Verde Islands. He covered 4,715 miles and spent 1,129 hours (47 days) at sea, averaging 4.2 knots over the whole journey. 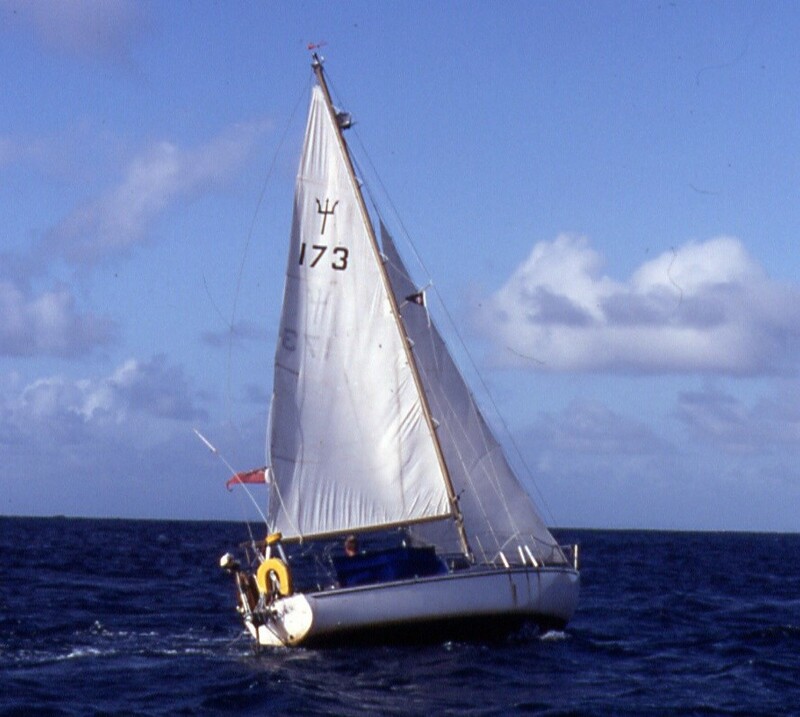 Writing in the TOA newsletter Trident News, he said: “I was fortunate in that for the first two legs, which would normally have involved a lot of windward work to clear the Bay of Biscay, I encountered North Easterlies. Although the winds got up to Force 8 (most of the passage to Spain was under storm jib) they enabled me to reach La Corunna only four days after leaving Plymouth. Most of the 700 miles to Madeira were a broad reach though this proved challenging to David’s Autosteer wind vane self-steering. After a week in Madeira he sailed on to the Canaries. 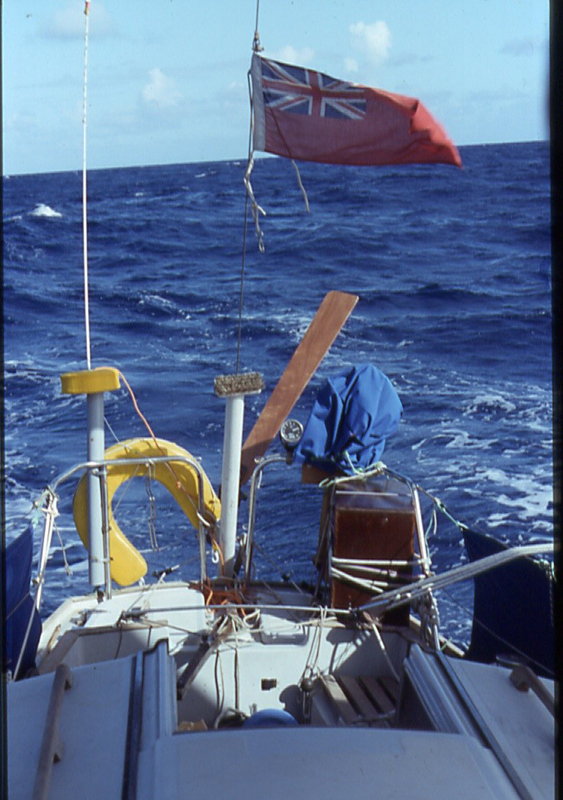 “This was only a reach South of some 270 miles but for some reason I was seasick virtually all of the way” which he put down to a particular combination of wind and waves. He spent almost a month in Las Palmas before setting off for St Lucia. But after two days a weld parted on his self-steering and the servo blade floated away. A rope wrapped around the prop sheared off the P-bracket and bent the prop shaft when he started the engine to recover the blade. Rather than steer all the way to St Lucia he diverted to Mindelo 800 miles away in the Cape Verde Islands to get the weld repaired. From the Cape Verdes he averaged 105 miles a day in the North Easterly Trade winds but the diversion to Mindelo meant he spent Christmas at sea – complete with tinned turkey and Christmas Pudding – surrounded by dolphins and pilot whales. He arrived in St Lucia in time for the New Year celebrations, covering 2,151 miles from Mindelo. To prepare his Trident for the voyage, David replaced the rigging, increasing the fore and backstay to 6mm and strengthening the chainplates. He also fitted mast steps which proved fortunate when his main halyard block failed in mid-Atlantic. David’s full account can be read in the members-only section.